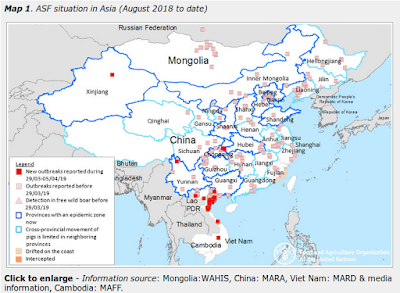 During the opening weeks and months of the 2009 H1N1 pandemic a number of countries worked to identify, and isolate, infected passengers arriving at their International airports in an attempt to prevent or slow the arrival of the pandemic virus to their nation. The reaction is a natural one; to deny entry to highly infectious carriers of pandemic influenza. And for some countries – particularly island nations like New Zealand and Japan, with no shared borders – it seems an attractive option. Prior to the pandemic many experts had expressed doubts - given the multi-day incubation period of influenza, the sensitivity of detection equipment, and the near certainty that some carriers will remain asymptomatic – that attempts to identify the infected based on fever, cough, or other outward signs of illness would prove successful. We’ve a new study published ahead of print in the May edition of the CDC’s EID Journal, that indicates that the mostly passive screening methods used at New Zealand’s airport were inadequate to slow the entry of pandemic flu into their country. Entry screening for influenza A(H1N1)pdm09 at Auckland International Airport, New Zealand, detected 4 cases, which were later confirmed, among 456,518 passengers arriving April 27–June 22, 2009. On the basis of national influenza surveillance data, which suggest that ≈69 infected travelers passed through the airport, sensitivity for screening was only 5.8%. Unlike some other countries in 2009, New Zealand did not employ thermal scanners, looking for arriving passengers or crew with elevated temperatures. Each unwell passenger and crew member was screened for influenza-like illness by a nurse and assessed by a medical officer if illness met the definition of a suspected case. Those whose illness met the case definition had nasopharyngeal swabs taken, were offered oseltamivir, and were sent home or to a facility for isolation. Reverse transcription PCR (RT-PCR) was used to confirm infection. Screening was escalated on April 29 to include all passengers arriving from other countries and stopped on June 22. The influenza A(H1N1)pdm09 screening program at Auckland International Airport had low sensitivity. This form of border screening is therefore unlikely to have substantially delayed spread of the pandemic into New Zealand in 2009. Limitations of influenza screening include the high proportion of asymptomatic infected travelers (5), incubation of infections acquired before or during a flight (3), reliance on self-identification, limitations of case definitions, and limitations of thermal scanning (6). Modeling data have shown that the ability of border screening to delay global pandemic influenza is closely linked to the effectiveness of the screening process or travel restriction used. To delay influenza spread by 1.5 weeks, border restrictions need to reduce imported infections by 90% (7). The entry screening program we describe does not meet these standards. As previously mentioned, other countries employed thermal scanners and far more strict interdiction techniques during the summer of 2009, yet their track record was not much better. In June of 2009, just as the pandemic was ramping up, I wrote Vietnam Discovers Passengers Beating Thermal Scanners, which looked at a Reuters report that a number of sick passengers flying into Ho Chi Minh City in Vietnam took fever reducers (Aspirin, Tylenol, etc) several hours prior to arrival in order to beat the thermal scanners. 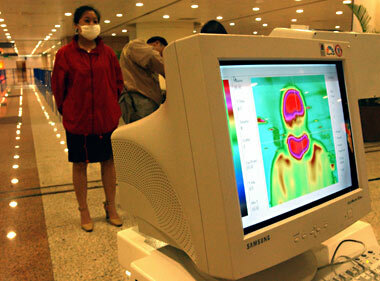 Airport thermal scanners detected only 12% of travel-associated flu cases; many travelers boarded flights despite symptoms. One quarter of patients were symptomatic when they boarded flights; 15% developed symptoms during travel. Airport thermal scanners detected only 12% of patients overall and only 40% of those with symptomatic infection on arrival. And finally, in June of 2010 CIDRAP carried this piece on a study of thermal scanners in New Zealand in 2008 (before the pandemic) presented at 2010’s ICEID. Thermal scanners for screening travelers do moderately well at detecting fever, but do a poor job at flagging influenza, according to researchers from New Zealand who presented their findings today at the International Conference on Emerging Infectious Diseases (ICEID) in Atlanta. The positive predictive value for fever was 1.5% for thermal scanners and 4.1% for tympanic thermometers. For influenza, the positive predictive value for the two techniques was 2.8%. None of the 30 passengers who tested positive for influenza had a tympanic temperature of 37.8°C (100°F) or higher, and only 2 had temperatures of at least 37.5°C (99.5°F). Three were asymptomatic. The group concluded that fever is a poor predictor of influenza, which limits the efficacy of thermal screening at entry points. During the 1918 pandemic, when international travel was far less common, a few nations managed to block entry of the pandemic virus by imposing a strict quarantine of all arriving passengers. The four successful quarantines during the 1918 pandemic were in American Samoa (5 days' quarantine) and Continental Australia, Tasmania, and New Caledonia (all 7 days' quarantine). The Spanish Flu did not reach American Samoa until 1920, and had apparently weakened, as no deaths were reported. ths after the flu has swept New Zealand with disastrous effects. Tasmania kept the flu at bay until August of 1919, and health officials believed they received an milder version, as their mortality rate was one of the lowest in the world. By strictly enforcing a 7-day quarantine, New Caledonia managed to avoid introduction of the virus until 1921. Eventually, once the quarantines were lifted, the virus did make it to these isolated regions of the world. Areas that receive a small number of arrivals might be able to institute a quarantine system (see Can Island Nations Effectively Quarantine Against Pandemic Flu? ), but even then the ability to interdict infected travelers won’t be 100%. Border screening might be conducted for reasons other than preventing or delaying an epidemic. It might provide public assurance and confidence that something is being done (14). The communication of health information and advice on how to seek treatment is consistently recommended as a pandemic prevention strategy (12,15) and is usually delivered as part of border screening programs. These benefits need to be balanced against the considerable resources used, opportunity cost (resources used for this activity and thereby unavailable for other activities), uncertain effectiveness, and inconvenience of border screening. To delay or prevent influenza entry at borders, influenza screening needs to be considerably more effective than the mostly passive program described here. Despite scant evidence showing that airport influenza screening would do very much to prevent or slow entry of a pandemic virus into a country, many governments may find it difficult not to at least be seen making the attempt. Which – if nothing else – will provide us with further evidence as to its efficacy (one way or the other) after the next pandemic is finished.